The Gods of Rock once again smiled upon the town of Austin, Texas. On a damp and foggy night, there came a whirlwind and the sound of loud guitars - a band unlike any other had made their way from New Orleans across the USA, and finally to Texas, to grace the Lone Star State with blessings and tidings of great amplifiers. This band - this SUPAGROUP -had come with a message... to SAVE ROCK AND ROLL, as well as support their latest self-titled CD on Foodchain Records. The mighty Supagroup blazed through a full set of new and older tunes, spreading the good word of ROCK to the hungry masses at Emo’s. From opener "Rock and Roll Tried to Ruin My Life" to closer "Back by Popular Demand" the packed crowd ate up their unrelenting stage energy. 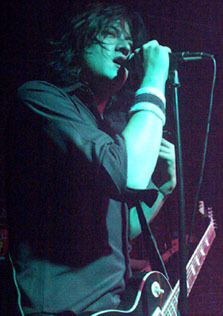 Led by the Lee brothers from Alaska, they call to mind the elder statesmen, AC/DC. Vocalist/guitarist Chris is all Bon Scott bravado and Mick Jagger swagger, while the half-man/half-Tasmanian Devil Benji rips out leads on his one-eyed SG that would make Angus Young yell "Crikey!" Add the solid bass and cowboy hat of Leif Swift and the groove-laden back beat of drummer Michael Brueggen and the result is a force to be reckoned with. Beers were raised and the sign o’ the devil filled the air. "We’re shooting a DVD here," announced Chris. "Let’s try it again!" -- after a few tries they got the crowd to yell IT’S GOOD TO BE BACK as loud as possible, as a blast-off into "Back By Popular Demand." Supagroup will be back again, by popular demand. I love doin’ this stuff. 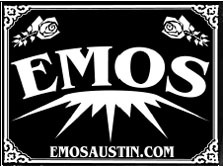 How else can one get into Emo’s for free, see a class act on stage and delight in a sea of hot women on the dance floor. A neo-hippie friend of mine, Tadd B, clued me into GF a couple of years back by lending me a CD of theirs. I took it to work to listen to in the prep kitchen and the Latinos seemed to enjoy it even though it wasn’t produced on a keyboard/sequencer. The group had seven members back then, they have twelve now. 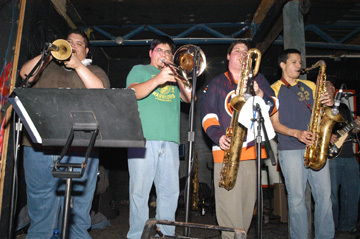 Grupo Fantasma boasts a horn section consisting of tenor and alto saxes as well as trombone and trumpet, three percussionists on drum kit, timbales and bongos, two guitar players, bass, keyboardist and lead singer. They play a lot of cumbias, a particular type of Latin American rhythm that is said to have originated with chain gangs of black slaves in South and Central America, the length of the chains shackled to their ankles dictating a rhythm that was short and quick. 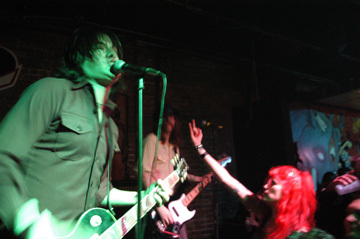 The large crowd at Emo’s was of the uptown type mostly with a healthy dose of hippies and other scenesters. I arrived kind of early and met Elliot, whereupon we decided to go to Casino and exchange intoxicants. With our judgement properly impaired we split and I creeped back to Emo’s and GF took the stage shortly thereafter. Your Red Hands will tug at your heart strings with their lead singer’s soft, sad voice. Sometimes sappy, emotional songs fit your mood, and this band can bring it to you. This mellow band overflows with calm, soothing, somber tunes. The best band of the evening took the stage and stole the show. The Fall Collection, with local boys Danny Dunlap, Josh Power and Danny Mackle, can shake you out of your sentimental slump with their pleasing pop rock tunes. A nice break right in the middle of a night filled with overflowing heartrending, tear-jerking voices. At times they had more rock than pop in their step and got crowd up off their feet for a better listen. Make sure you check out their website, www.thefallcollection.com. They announced the website twice during their performance and want people to stop and by and offer feedback.